Hodgkin & Huxley developed the voltage clamp, which allows ion concentrations in a neuron to be measured with the voltage constant. Using this device, they demonstrated changes in ion permeability at different voltages. Their mathematical model of neuron function, based on the squid giant axon, postulated the existence of ion channels governing the action potential (the basic electrical signal of neurons). 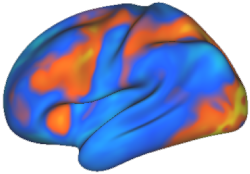 Their model has been verified, and is amazingly consistent across brain areas and species. You can explore the Hodgkin & Huxley model by downloading Dave Touretsky's HHSim, a computational model implementing the Hodgkin & Huxley equations. Implication: The mind, largely governed by reward-seeking behavior, is implemented in an electro-chemical organ with distributed and modular function consisting of excitatory and inhibitory neurons communicating via ion-induced action potentials over convergent and divergent synaptic connections strengthened by correlated activity. This was a deep “reductionist” moment that I think also must deserve some credit for overturning vitalism and the idea that some “vital force” distinguishes living matter from ordinary matter. Also you might see it as finishing what Galvani started when he touched his statically charged scalpel to an exposed nerve of a dead frog. More than “cognition,” H&H’s explanation of APs is about what “animates” animals–including us.